Brunswick have survived an early scare from Balwyn to march to victory and maintain their place in the top three. Balwyn got off to a great start, racing out to a 2-0 lead in the first half; but Brunswick managed to get one back before the break to get themselves back into the break. The second half was all one way traffic though, as Brunswick put their foot on the accelerator and put six straight goals past a shellshocked Balwyn. Michele Salvi was the catalyst behind the Bulls’ victory a second half hat-trick. Carlton Heart have come from behind in the second half to beat a resilient Fitzroy. The Tigers took the lead in the first half through Corey Sewell when he forced his way past Fodis Karatzas in the Carlton goal. The Heart did everything in their power to find an equaliser, but Fitzroy’s Ryan Timmins was impenetrable between the sticks, denying Carlton on every occasion leading up to the half-time break. However, straight from the kick off following the half-time break, Fitzroy’s defence fell asleep and Arturo Diaz got in behind and slid his finish past a helpless Timmins. Diaz scored a second not long after to turn the game on its head, but Fitzroy reorganised and played on the front foot after going behind. Still without an equaliser with two and a half minutes to play, the Tigers deployed the fifth-man tactic. 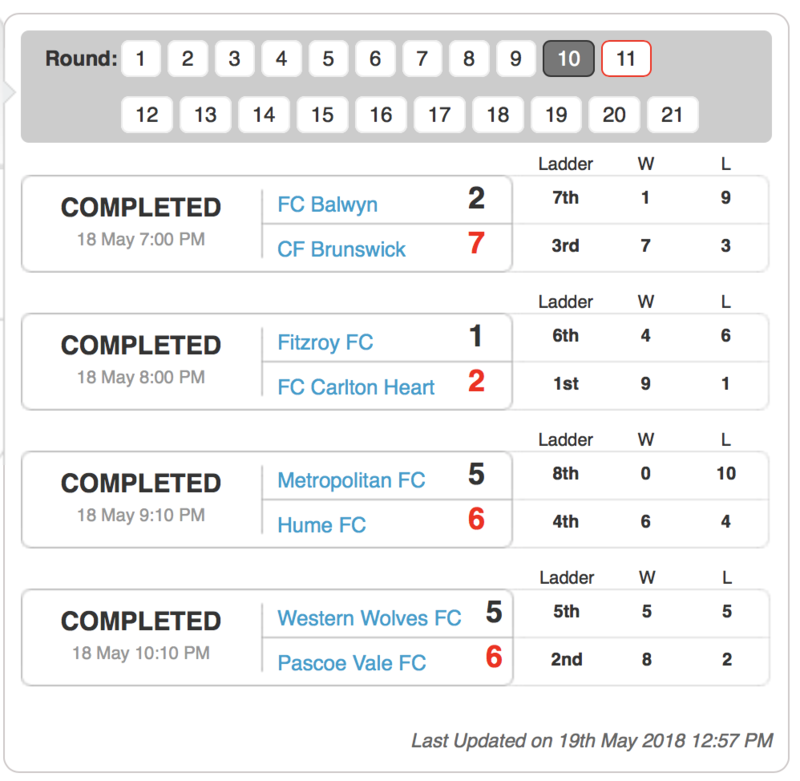 Fitzroy moved the ball around nicely, but they were unable to generate any clear cut chances, and the Heart held on for a crucial victory that leaves them temporarily six points clear of second place Pascoe Vale, who have a game in hand. Hume have capitalised on a good start to stave off a fast-finishing Metropolitan and hang on for all three points. Hume’s Mario Petrovic was on fire in the first half, helping his side storm out to a 4-2 half-time lead with a hat-trick before the break. 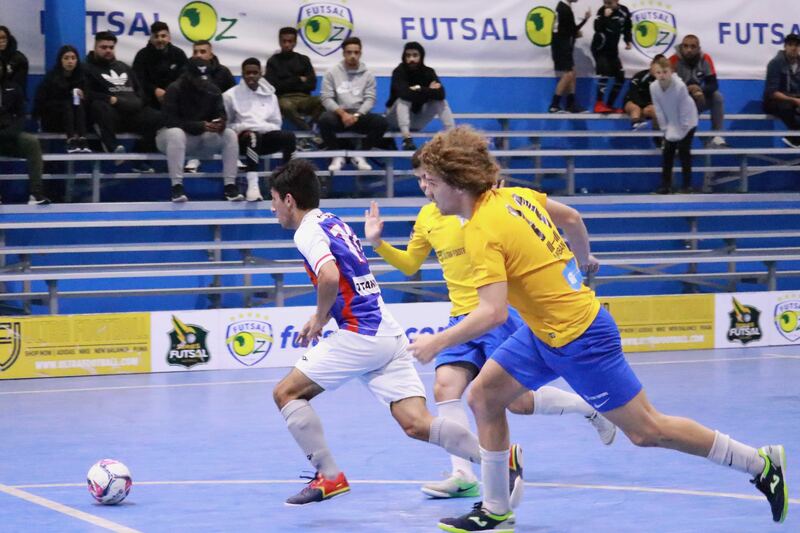 Metropolitan showed resistance in the second half, with talisman Adrian Zahra leading the charge for the Foxes as they cut Hume’s advantage to just one goal with the scores at 5-4. Hume’s Muhammed Temel scored his side’s sixth of the game to seemingly put the contest to bed, but a quick reply from Alija Redzepovic ensured the match would go down to the wire. However, Metropolitan were unable to fashion another goal-scoring opportunity and Hume held on for the win. 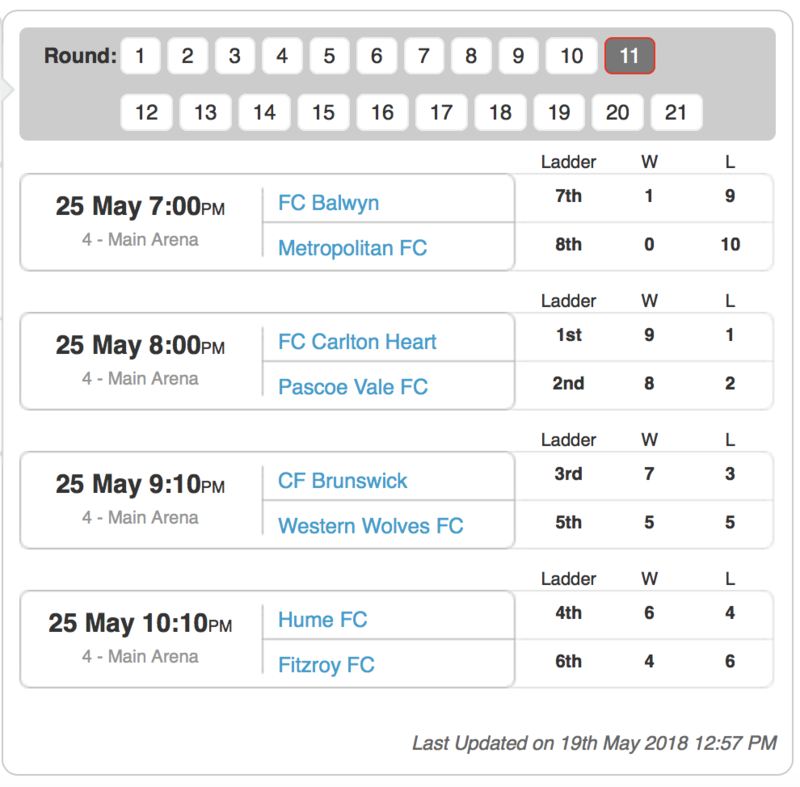 Pascoe Vale have come out on top after a thrilling match against the Western Wolves. 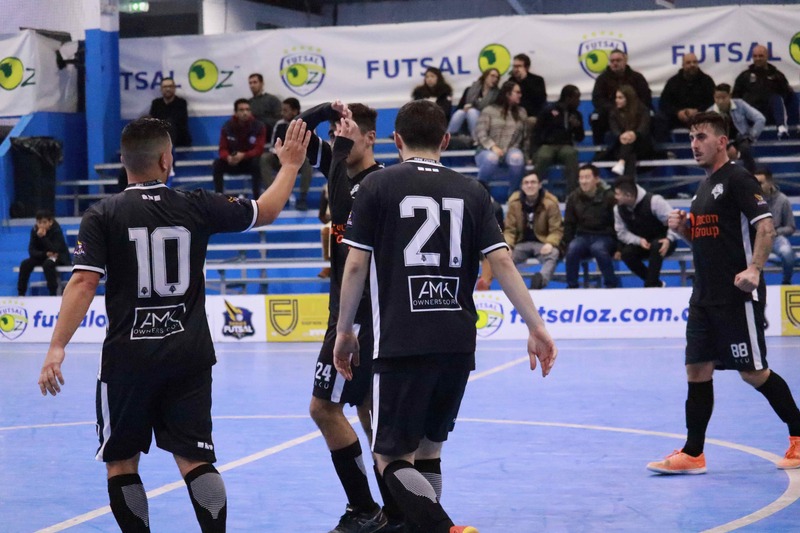 Both sides played enthralling attacking futsal and created a magnitude of chances, and it was Pascoe Vale who took a 2-1 advantage into the half-time break, courtesy of first half goals from Rico Hauser and Lucas Vaz. 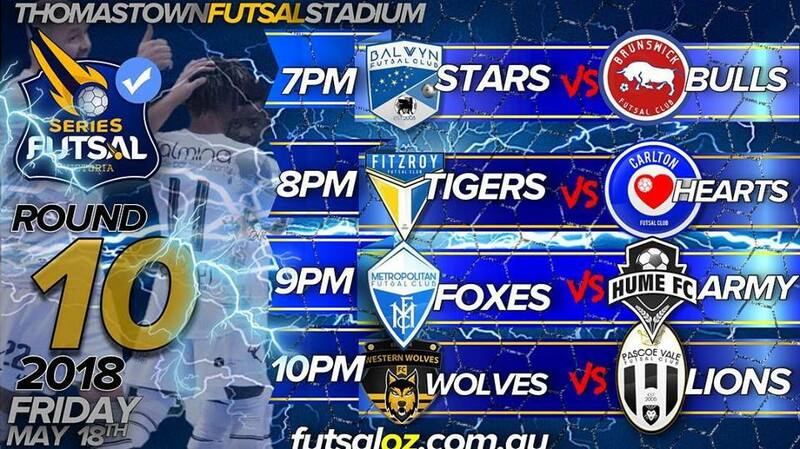 Pascoe Vale opened up a 5-3 lead in the second half, but two quick-fire goals from the Wolves, including a very well executed volley from Ahmed Azzam, brought the Wolves level. 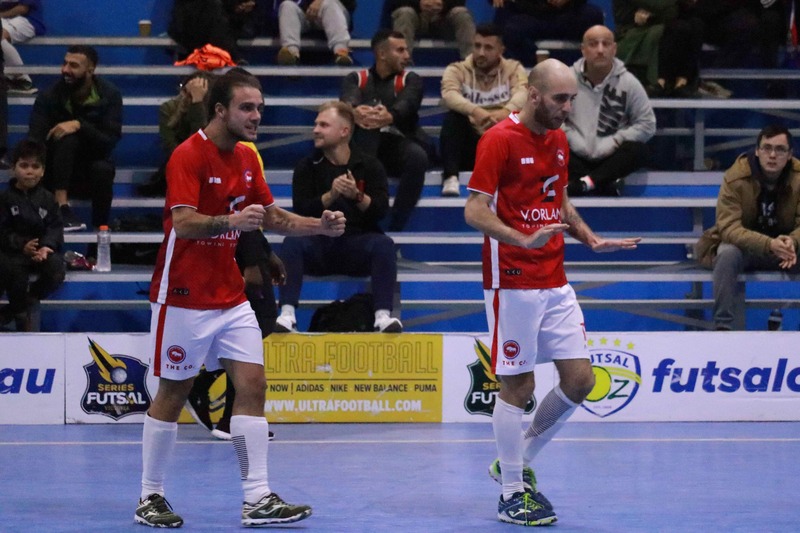 With the game tied at a deadlock with six and a half minutes to play, Pascoe Vale captain Andre Caro stepped up to fire home from just outside the penalty area and swing the game back in his side’s favour. 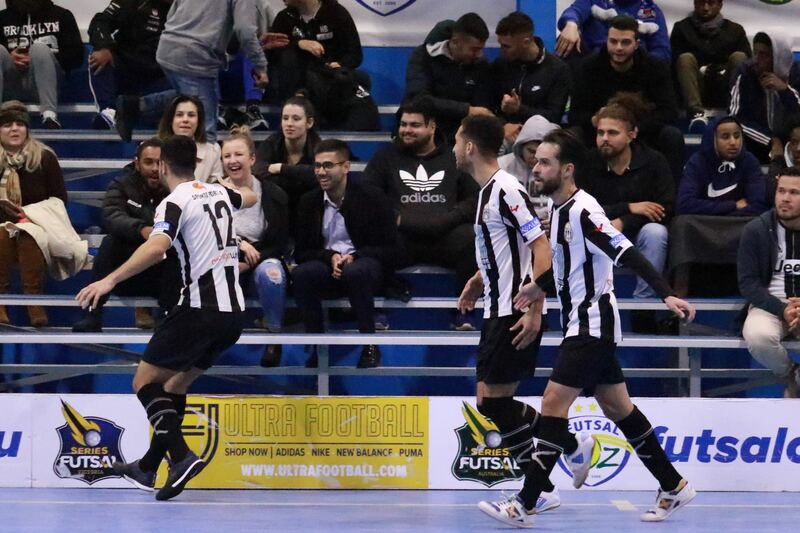 The Wolves pushed Pascoe Vale to try and find an equaliser, but as the minutes ticked down and no equaliser came, the Wolves players became increasingly frustrated and began firing shots from range in hope of finding the back of the net. 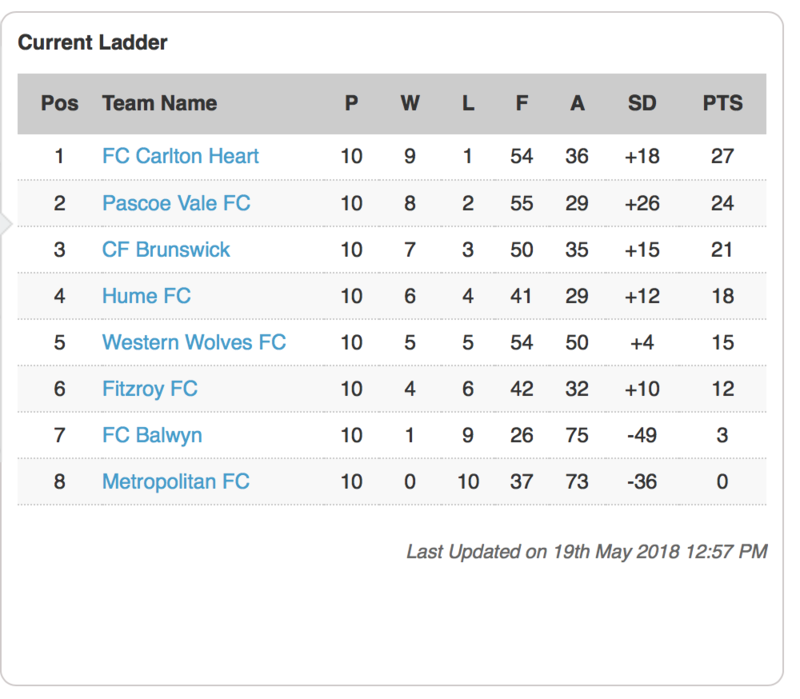 Pascoe Vale ultimately managed to hold on, leaving themselves just three points behind ladder-leaders Carlton Heart, setting up a mouth-watering tie between the top two sides next Friday night.